WordPress is a free and open source blogging tool and a content management system (CMS) based on PHP and MySQL. You will find it quick, easy and powerful in managing content on your website(s). To install Wordpress on your website, follow the instructions below. 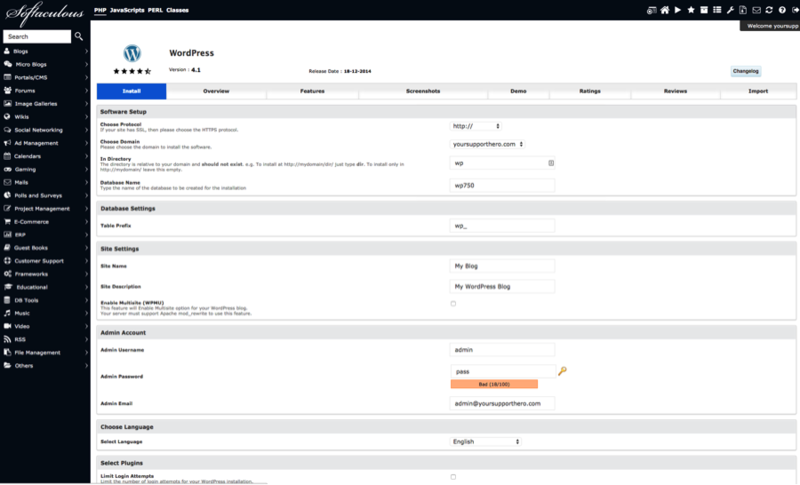 3) Once in to the cPanel interface, scroll down under “Scripts” and click the WordPress link. 4) Click the blue Install button at the top of the page. 5) Fill out the fields for your website. If you arrive at a field where you are not sure of what to put, leave it default. For our example, we’ll just recommend you change the Site Name, Site Description, Admin Username, Admin Password and Admin Email. 6) Optional: You can use one of the preloaded themes if you desire. You can always change this later. 7) Click the Install button (pictured above) after you have entered your email address for installation instructions.